It’s all about the data if the pundits are to be believed. The more you know about your customers and prospects, the better your business will do. That last statement is certainly true. But data doesn’t equate to knowledge. And data certainly won’t just lay out the exact decision you should make when it comes to execution. Intuition is one of the least understood aspects of entrepreneurism and marketing. Yes, research and the resulting data are how you make informed decisions — but you’ll still ultimately rely on your gut to make any significant move. Bernadette Jiwa’s most recent book is entitled Hunch: Turn Your Everyday Insights Into The Next Big Thing. In it, she makes the case for the power of intuition, and how to further develop your own capacity for groundbreaking insights. Today Bernadette joins us to share some of her own insights about intuition. She also lays out the three personal aspects you’ll need to cultivate to unleash your own intuitive power. Unemployable is brought to you by the all new FreshBooks, easy accounting software for freelancers and small businesses. Check it out for yourself with an unrestricted 30-day free trial — simply click here and then enter Unemployable in the “How Did You Hear About Us” section. Bernadette Jiwa: I’m Bernadette Jiwa. I help companies, big and small, design, build and grow brands they’re proud of. And I am unemployable. Brian Clark: It’s all about the data if the pundits are to be believed. The more you know about your customers and prospects, the better your business will do. 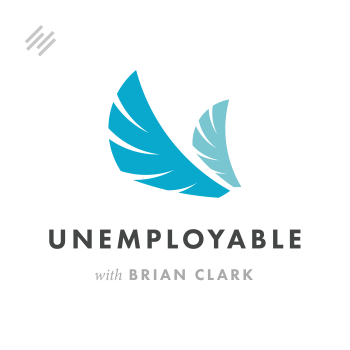 I’m Brian Clark and this is Unemployable, actionable advice for freelancers and entrepreneurs. Thanks for tuning in. Bernadette, it’s great to speak with you. It’s been a while since we saw you at one of our events, one of those years. That was great. You did a fantastic job. I remember that much. Bernadette Jiwa: It was a great event. I loved coming to Denver. Thanks for having me there and thanks for inviting me back on the podcast. Brian Clark: Absolutely. We’re going to talk about intuition today, because you have a relatively new book. Another great book with a one-word title. For some reason in 2014, you started with the one-word title. I think there was Difference and then there was Marketing and Meaningful and now Hunch. Did I get it right? Bernadette Jiwa: You’ve got it just about right. Brian Clark: Just about, close enough. Bernadette Jiwa: Yeah. It’s good. You’re right. I like those. I started to go to those one-word titles and I still love them. Next one’s not one word though. Brian Clark: Oh, well, sometimes it’s not the right fit. What Drove You to Write About Intuition? Frankly, I have to admit that in the last 20 years, it’s only been recently that we’ve started smartly, I would say, systematically incorporating data. It’s been mostly a case of intuitive thinking for me. And that’s not to say it’s uninformed, it’s just a different approach. Enough about that from me. I want to hear why this topic for your current book. What was it that drove you to write about intuition? Bernadette Jiwa: Part of the reason was some of the things you’re saying. Many of the business owners that I consult with using data or the lack of data as a crutch. So, “We haven’t got enough data,” or “When do you ever have enough to press the button and go on something?” And the other piece of it was that they were not trusting their gut. They weren’t actually developing the skills within themselves. So just relying on the data. What I found when I was researching the book was that people like you who trust their gut and go, they share three qualities, which are curiosity, empathy and imagination, which when you think about it, makes perfect sense. You are no different to Steve Jobs or to Elon Musk. And that we’ve all got the opportunity to develop those qualities in ourselves. Have We Been Taught to Ignore Intuition? Brian Clark: Well, that’s very flattering. I wish I had the respect of bank accounts, but I can’t complain. We’ve done well. This is not just a “why” book. It’s not just why intuition is still valuable and crucial, I would say, in modern marketing with this ocean of data that we’re all swimming in. But it’s also a bit of a “how-to.” How to develop, how to pay attention more and notice when you’ve got that gut feeling. Is that something that we’ve almost been taught to ignore these days? Bernadette Jiwa: I feel like it’s something that we are beginning to ignore, because we can rely so much on proof. And when have you got enough proof? How much proof is enough? What I was seeing again was that people were saying, “Well, I’m not sure that this is the right way to go.” When you think about it, no entrepreneur is sure. There’s no guarantee of anything. You weren’t sure when you launched Copyblogger if it was going to succeed or not. You probably had no idea that it was going to grow into such a great business and that you were going to have this massive following. Likewise, the Dyson Vacuum Cleaner and Starbucks and Spanx and all of the great products that we know, love and use, where was the data for those things? What Are the Three Qualities Successful Intuitive People Share? Brian Clark: Yeah, that’s an excellent point. Now you listed three characteristics of successfully intuitive people. Run those by me again, and let’s kind of go one by one on how we might be able to expand those capabilities in ourselves. Bernadette Jiwa: Curiosity is the first and empathy and imagination. How Can Curiosity Be Cultivated? Brian Clark: Okay, that’s interesting. There are definitely people who we might label as incurious, which I think is just a shame, and there are other people who are just naturally curious. I think I might fall into that category. I always want to know why. I always want to know more. How do we cultivate curiosity if it’s not an aspect that is just naturally occurring? Bernadette Jiwa: We learn to ask more questions, as you say. We learn to dig deeper, we learn to question and also, we learn to get our heads out of our smartphones. That was another one of the things that made me really want to write this book, seeing how immersed we are in our own filter bubbles and how we’re never bored for a second. We’re never looking around us for a second, for the most part. We’ve always got our heads down, our ear buds in, and that’s stopping us making vital connections between what’s going on in the world around us and what the world might need next. Brian Clark: So, perhaps another discipline that gets a lot of attention now — mindfulness or just awareness of what’s happening around us could be an aid to our own curiosity. Bernadette Jiwa: Well, it’s a way for us to practice switching off, getting in tune with our own bodies, and then perhaps we extend that when we go out into the world and get curious about other people. A lot of the time, we’re about optimizing ourselves. All the interesting writing and research about optimizing ourselves, our bodies, our days, productivity, and we’re not so curious about the world around us as I think we used to be. Brian Clark: Yeah, I think that’s a good point and the smartphone is a big part of that. There is no denying it. Even I’m finding that I leave it in other rooms to get it away from me, even if it’s off. There’s some recent research that says, even if you have the phone near you off, you will focus less just by the compelling nature of glancing at it and going, “Maybe I should check.” That’s just disturbing how these devices that are supposed to make our lives better, and they do in moderation, but I think that’s gone way overboard in really being open to opportunity that’s all around us. There’s also this aspect of having enough ideas to find the ones that are compatible at an interest and passion level. And without sufficient curiosity, you’re just not going to see it. Instead of going, “Oh, that’s just bad design,” or making assumptions, we can think about how we would fix it instead of leaving it up to somebody else. And it’s actually fun to do. It gets to be fun to do. Brian Clark: Yes. You mentioned as an aspect of curiosity the ability to not only notice things or opportunities, but other people. I think that leads us directly into empathy, which I’ll have to say is my number one thing when it comes to making decisions. It’s not data free. You do a lot of research, and with social media, we can learn more about people out in the wild, not through surveys or focus groups, but how they interact within a certain topical realm or with a certain type of people. Yet again, we’re looking at metrics that might have nothing to do with that, because we’re interested in, like you said, optimizing our thing and not realizing that the key to optimization is understanding the people you’re trying to communicate with better. Bernadette Jiwa: Bingo! What’s interesting about what you said there was that what you’re pointing to is what I’m alluding to is there are different kinds of data. It doesn’t have to be something you can plot on a spreadsheet. Sometimes the data is in the stories. I’ll share with you a story that happened to us just before the US election. I was in New York with my husband. He was at a behavior summit, and people like Nate Silver were there and Daniel Kahneman and the great and the good, brilliant thought leaders. They were saying that Hillary Clinton would win by a massive margin and we all believed that. What he was doing was he was gathering data by looking people in the eye. The data was in the stories of the people on the street who he was speaking to, who maybe weren’t New Yorkers, who were out of town, and people from out of town chatting to him about their hopes and dreams and fears. And that’s what he was picking up on. Brian Clark: That’s fascinating. Of course, since the election, as we went through the endless cycle of people trying to explain how this happened, I think some of us, hopefully, gained a greater understanding of why certain people felt, regardless of other factors, which were substantial, that this is who they wanted to vote for. Again, empathy, put yourself in someone’s shoes and then go walk a mile in them. They’re both clichés, and yet that’s exactly what’s missing from modern political life. And I’d say from a lot of the marketing and advertising that we see. Now, the things that work really well seem to just nail the empathy of that particular person, that particular group that you’re trying to reach, even as it alienates everyone else, yet I think that’s what it takes at this point. That’s something I’ve been really harping on lately from a strategic standpoint. If you’re going to create content, you have to understand the worldview from their perspective. You have to understand the language they use, not the language you prefer. I think our egos get in the way of empathy. That’s rule number one. How do we subsume our own egotistical desire and self-interest to really understand people? Because ironically, ultimately you achieve your goals by serving others, yet I think sometimes we lose sight of that. Bernadette Jiwa: That’s the thing. You actually get to where you want to go by understanding the people you are going to serve and respecting them, and not feeling like you should know better. Everything from the work that you do to something like the Blue Apron. Something like Dollar Shave Club, where they can come in and disrupt a massive incumbent brand, because they know what it feels like to be a man going to a drug store, trying to buy a pack of razors that cost $20 that shouldn’t cost $20, and how inconvenient that is. From 2012, I think they were founded, to a billion dollar acquisition in just four years. That says something. That was just a couple of guys thinking about what the problem that tens of millions of men were facing every day was. And you’re right, it’s actually smart. It’s actually smart to be empathetic, and to be so sincerely, not just to use it to manipulate either. There’s a process called empathy mapping, I don’t know if you’re familiar with it, but you’re trying to glean how people think, feel, see, experience the world. Then at some point from that, you do have a sense that you know how they feel, how they view the world, even if it’s different from your own personal perspective. What I personally do at that point is it’s almost like I’m writing a novel or creating a work of fiction out of characters based on real life people, through research. Is that what you mean by imagination? Because that’s what I do. I start imagining their day. I imagine how they view their problems or desires. And then I create a narrative that I translate into a guiding sequence or editorial vision of content to connect with those people at that level. Bernadette Jiwa: That’s really brilliant and thanks for sharing that, because I think that’s really valuable to people. A lot of the time, we’re so focused and in love with our product that we forget to do that. Instead of falling in love with our product or our service, we need to fall just a little bit more in love with our customers and our clients. How I like to do it is think about writing or creating or whatever it is for one person at a time. For somebody like you with this massive audience, it’s really tempting to sit down and think, “I’m speaking to everybody here,” instead of trying to narrow it down to one person just like you and I are talking here. Be sincere and speak to that person and really get a handle. That’s difficult sometimes in a digital world. And that’s why it’s important to also go out and meet people and be curious about and have conversations of what it is that they care about and think about and dream about their hopes and their aspirations too. How Much of Cultivating Intuition Is the Courage to Trust Your Gut? Brian Clark: Excellent. How much of this cultivation of intuition is the courage to trust your gut? On the flip side of that, it’s scary because there’s nobody to blame if it goes wrong. There’s no fall back. So, part of the challenge is getting over this uncomfortable fear of not knowing for sure. How I describe that in the book is when you’re a kid up to the age of three, not knowing is a good thing. When you get to school, what happens is you recognize that knowledge is currency, because the people who get the best test scores go to the best colleges and presumably have the best lives, because they get the best jobs and the best income. That’s how we’re measuring things as we go. In this quest for the best, which is all the right answers in the test, we get really uncomfortable with saying, “I don’t know.” That’s what stops us doing something like being a really visionary entrepreneur, because we don’t know for sure. And that’s uncomfortable. Brian Clark: Yeah. The lack of certainty. I think there are some personality types that just simply don’t do well with it, although I do think anyone can grow personally in order to deal with a little more ambiguity. At the same time, I don’t want people to think that we’re just saying, “Let’s do this. It’s cool. People will like it.” No, it’s highly educated guesses. You’re never sure, as you mentioned earlier. I didn’t know for sure and I certainly didn’t know that starting Copyblogger was going to lead here. But all we did was take it a year at a time and build upon what we had — another educated guess, when we started developing products, and it worked. Brian Clark: I think there’s an aspect here that we may also want to highlight, which is recognizing when your educated guess is either slightly off or wrong, and also having the ego defeating ability to change, to pivot, to adjust. Honestly, that’s the only reason we’ve never had a product fail is because when it wasn’t going according to the educated guess, we move quickly because you’re getting other signals that show you what the actual right path is. Bernadette Jiwa: Give me an example of that, because obviously when you started Copyblogger, you started small. You didn’t start with the size of audience you have now. You started with a small audience and you grew, because you were doing things well. What might be an example of a pivot or why you’ve never had a fail because you changed tack? Almost every time that we develop something new, our initial ideas are pretty close. But once we put it out there, for example, it’s a more than minimally viable product because of the audience, yet it’s still not fully formed. Now if I had dogmatically stuck to my original vision for whatever it may be, then I don’t think we would’ve had the same success, because there is a balance. Again, I just come back to the fact that people misunderstand intuition. It is coming from an informed perspective, but you never find with certainty the answer. You’ve got that feeling in your stomach that this is it. I think that’s what’s so maddening about intuition to people, because we’re coming full circle. It’s just misunderstood. And I think your book clears that up quite a bit. Bernadette Jiwa: Oh, thank you. I’m glad you found it useful. What’s also interesting about what you’re saying, as I point out, it’s not a lucky guess. It’s not looking into your crystal ball with no information behind you. It’s informed. It’s an informed decision. It’s informed by something. What’s interesting about why intuition has gotten a bad rap lately is the great work of people like Daniel Kahneman, who has shown that when it comes to decision making our intuition can be flawed. On the flip side of that, what I found interesting when I was researching the book is so many great quotes from scientists, from Stephen Hawking to Einstein, who talked about making intuitive leaps and how intuition was really important to their work. Even scientists start off with some hypothesis. Daniel Kahneman couldn’t have started and done the work that he’s done in decision science and behavioral economics without having some kind of gut instinct that he should dig deeper into this thing. That’s what you do. You pay attention to the people who you want to serve. And you’re saying, “I think we’re seeing that lots of people are coming up with this challenge. This might be an opportunity for us.” You’re not just going in blind, you’re actually looking for problems that are in search of solutions, unmet needs that haven’t been met. Brian Clark: Right. As a CEO who refuses to look at a spreadsheet, I feel incredibly validated here. So, thank you for that. Bernadette Jiwa: I think people will be surprised that you don’t look at spreadsheets, don’t you? Bernadette Jiwa: What do they send you instead? Brian Clark: I’m a writer at heart, so they send me Google Docs with narrative instead. They know to tell me what the numbers mean as opposed to me staring at the numbers. Bernadette Jiwa: Bingo! What do the numbers mean? What does this mean? What is the story behind the numbers? Going back to the political thing, I think that was the issue — that we were so focused on numbers and not thinking about the stories behind the numbers. We are also focused on the numbers in our little patch. If there’s ever a case for getting outside your filter bubble, the Brexit in the UK, the US election are our two cases in point. Brian Clark: Yeah, there’s no doubt about that. And I think it needs to bring a little more attention to this matter from a different perspective. Everyone, it’s a great book, Hunch. Pick it up at Amazon, all your major bookstores. I did spot it in Barnes & Noble the other day. So, good news there. What Is the Next Topic You’ll Cover? Brian Clark: You’re already working on another book, you’re very prolific. I’m kind of jealous. Can you tell us what the next topic will be? I want to take people back to their backstory — why they started their company in the first place and what their values are, and what their mission is, what they’re here to do. And help them to realize that that’s also part of their story, and see how they can leverage story, not just as a way to create value and communicate that value, but as a way to create a culture and to do work they’re proud of. Brian Clark: Another one of my favorite topics, so I will be looking forward to that. Bernadette, thanks so much for taking time to visit with us today. Bernadette Jiwa: Oh, thanks for having me, Brian. It’s always a pleasure to talk to you. Brian Clark: All right, Everyone, you heard it. Intuition is not a bad word. It’s still informed by research, information and data. I think what we tried to get across here, data without meaning is meaningless, literally, I guess. Anyway, all right. That’s it for this week. Whatever you’re up to, whatever your next phase is, your next goal, keep going.